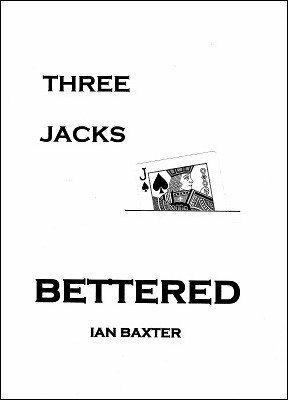 Jon Racherbaumer steps forward with a very keen Introduction to this Baxter treatment of the classic Three Jacks Deal. “…celebrate and perform Baxter’s latest, evolutionary entry.” It has been around since 1928, but this version guides it well into the 21st century. Ian Baxter has accomplished something remarkable. He has taken a wonderful classic self-working effect, that has been described and worked on by such luminaries as Walter Gibson, John Scarne, Rufus Steele, Harry Lorayne, Ed Marlo and made it even better, more direct, less dealing procedures while preserving the effect, the sleight-less feature as well as adding an additional climax. This kind of improvement happens very rarely. Ian Baxter has re-examined the plot and skilfully applied Occam's Razor to trim the handling to a streamlined size, giving it a punchier finish. This alone should be sufficient incentive to revisit this enduring presentation. Therefore, you can use and enjoy it "as is" or use it to spark your own experimentation and fiddling. The effect is that of a poker deal. You deal cards several times motivated by a story of a Big Fella boasting to a Little Fella about dealing a winning hand at Poker. 1st edition 2012, 10 pages.